*ISTE Workshop: Transitioning to the Common Core with Google Apps – Join me! In my previous post “Common Core: What is a ‘complex text’ anyway?” I wrote about the three aspects of a text that the Common Core measures to determine its “complexity,” which include: 1) quantitative, 2) qualitative, 3) reader and task. Hopefully, that post helped to clarify how we as educators can evaluate the complexity of a text we are using with our students. This blog will focus on ways we can support students in reading, understanding and analyzing those texts. 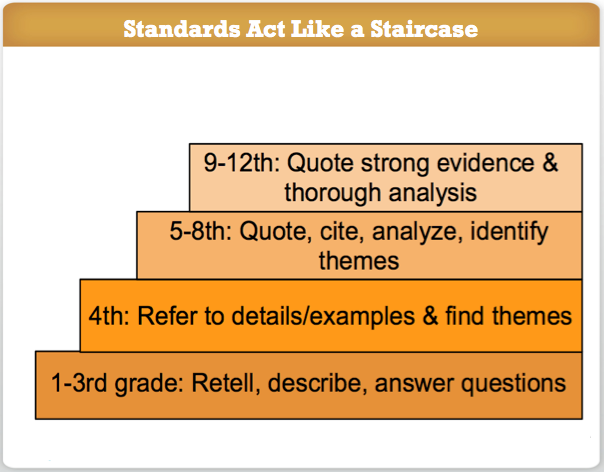 The individual standards for each grade level vary and the standards themselves act like a staircase. Although the strategies I discuss are used at the high school level, I hope they will serve to spark ideas for teachers in elementary and middle school. Each year, I have students enter my room who claim to hate reading. They say it is a waste of time because they never remember what they read. At first this surprised me. After ten years in the classroom, I understand why they don’t enjoy or remember what they read. Most students are not really thinking about what they are reading. Few students have been asked to slow down and process a text. 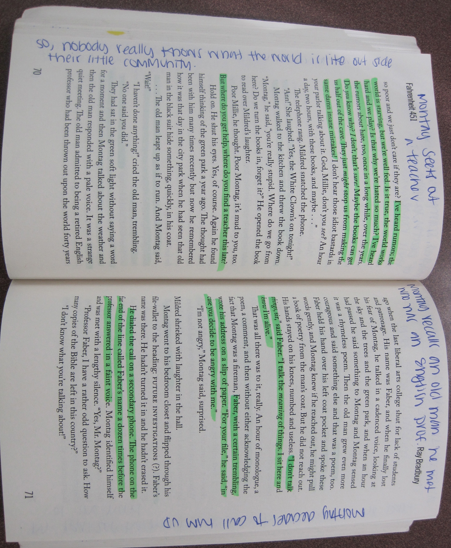 Annotations are not a new strategy, but few, if any, of my incoming 9th grade students have ever been taught how to annotate. In college, annotations were the only reason I survived as an English major! To be effective, students need concrete strategies to ensure that annotations do not add exponentially to their work load. Providing students with tips for how to highlight and annotate can make a big difference in the success of this practice. As more teachers begin to supplement and replace traditional texts with digital texts, it is important that students learn how to organize, process and share online resources as well. 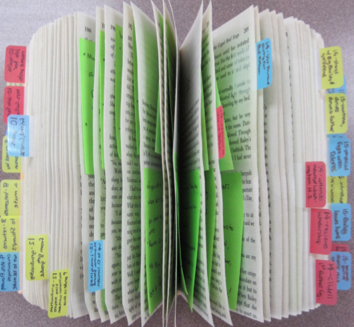 Diigo is a fabulous tool for highlighting, annotating, bookmarking and sharing digital texts. 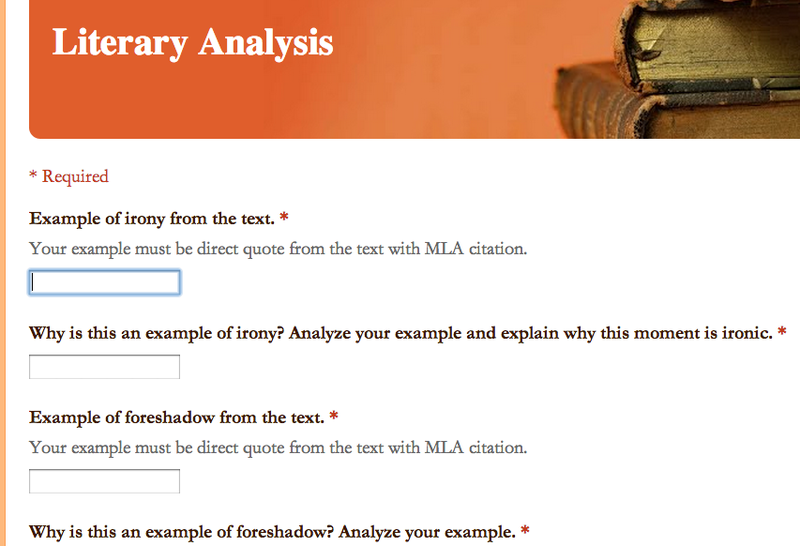 Teachers can create a Google doc with two columns – one for text and the other for annotations. 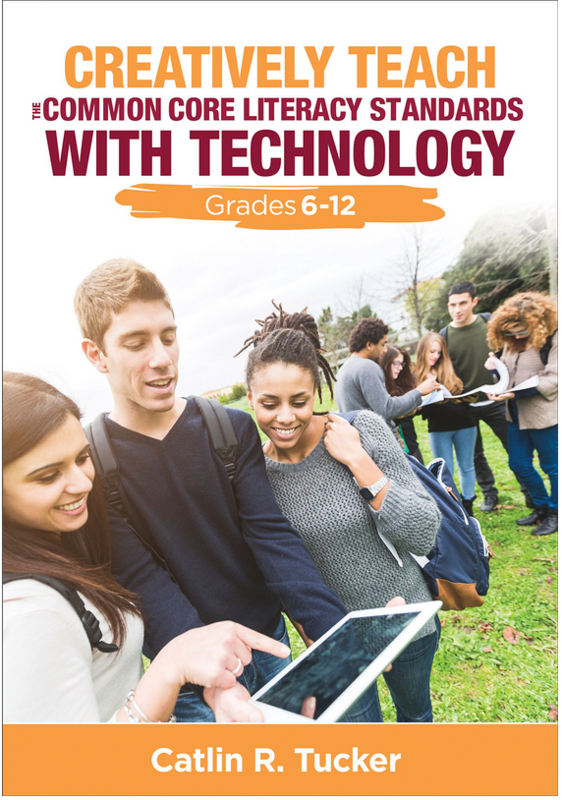 This doc can be copied and shared with a small group of students who can read, annotate, and discuss the text using the instant message feature. The beauty of using Google is that it can be done asynchronously (occurring at different times) for homework if you are working with older students or students with access at home. It can be done synchronously (at the same time) with students who are younger, need practice, or do not have reliable access to internet outside of the classroom. Students can ask each other questions, use the “define” tool to look up words they don’t know or the “research” tool to find out more about a concept. 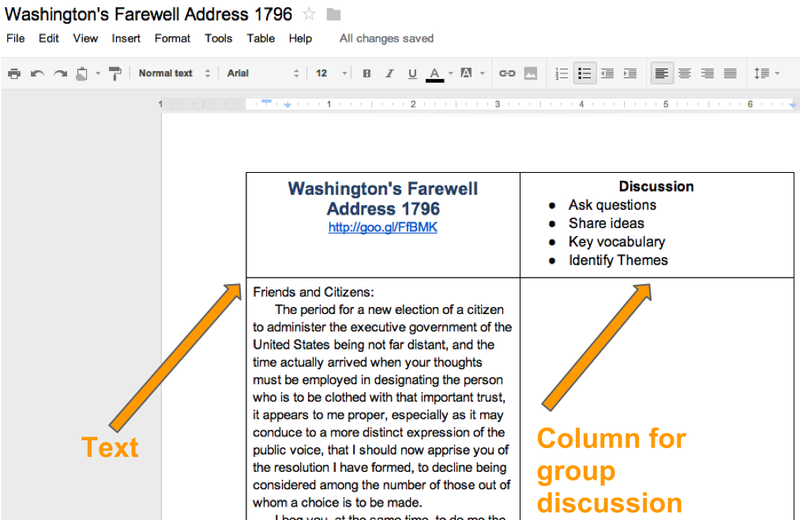 Google docs makes it easy to connect students with each other and with a variety of tools to enhance their understanding of a complex text. I love collecting information using Google forms. All of the information is stored neatly in a spreadsheet I can access any time and/or share with others. Instead of making a stack of handouts with questions, why not have students submit responses via a Google form? This way you can grab examples of strong responses to share with the class so everyone can benefit. I also love using anonymous responses to get students critiquing each other’s writing to improve their analysis, grammar, citations, etc. If you use paper graphic organizers with students and want to take them online to incorporate media and facilitate collaboration, I will be focusing on that in my next blog post about the Common Core Reading Standards. 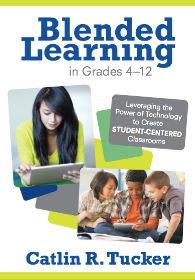 Preorder your copy of Creatively Teach the Common Core Literacy Standards with Technology. Just in time for summer reading! Hi! Thank you for this article. May I suggest Zotero for content curation, citation generation, and annotation of articles and books found online? It is useful for printed texts as well. Thank you for the suggestion, Heather. I have not heard of Zotero, but I will check it out. Thank you for this article! Very useful! My 9th graders are stuck with a text that is written at a 12th grade level and I can’t ‘ditch’ it so I need many techniques to help the 2/3 of my students who definitely are not reading at a 12th grade reading level! I hope these techniques will help your students better understand their text. That is a challenging situation. Good luck! This post is fabulous. I have been looking for someone with the light on for a year, but just now discovered you. Thank you so much for sharing your innovative and helpful ideas. I will be consulting your site for questions that I have. Just perusing through some previous posts has connected some dots for me. Now I feel I have a place to begin incorporating ideas. You are sharp. You are professional. You are a brave pioneer! And you are almost shockingly generous with your strategies, plans, and lessons. Keep up the great work and hope to meet you someday. Thank you for the kind comments, Debra! I’m happy to share what I am doing that is working. I’m thrilled to hear it is helpful for other educators. I hope our paths cross too! Hi Catlin! I teach Middle School ESL and have been researching close reading. Daily, my students face text that is YEARS above their reading level. I think close reading will help them greatly, and I’ve been searching for articles to help me implement it. I know that annotation will be a great part of what they do, but I really struggle in getting them to do it. This page was the most helpful thing I saw in weeks of researching. Thank you so much for posting! I’m thrilled you found this useful! I just started my second book and the chapter I am writing now is focused on developing reading skills (with a blended approach). I was just referencing this blog post. You comment was nice validation that this information is useful! I would like to be able to print a copy of this article to share with students and colleagues. However, I find when I try to do so that the images do not fit the page. Do you have a suggestion? I’d suggest copying the text and removing the images. I don’t know of a way to adjust the size of an image if you are attempting to print. I’m sorry I cannot be more helpful! Don’t Just Read Shakespeare, Perform It!